Tired of deciding what to cook for dinner every night?? One of the biggest challenges we all face is coming up with a plan for what to cook for dinner night after night. After a long day of work, you arrive home tired and hungry. This is especially true when you are trying to eat better and lose weight. Please Note: This eBook is available in PDF format and can be immediately downloaded to your Computer, Tablet, or SmartPhone and then printed! Most anyone who has struggled with weight loss will tell you meal planning is key for lasting weight loss success. Each weekend sketch out a plan for the week to come and then head to the store for the ingredients you need to execute it. Next weekend do it again. And then again. After a few weeks you’ll have formed a habit. Reduced daily stress. Improved the quality of meal time. Taken a huge step toward healthier eating and lasting weight loss. “We just don’t have time to search for recipes, calculate calories (or points), write out a shopping list, and figure out what to make every day. Each night you could just walk into the kitchen and get cooking? You can with my Month of Meal Plans eBook! 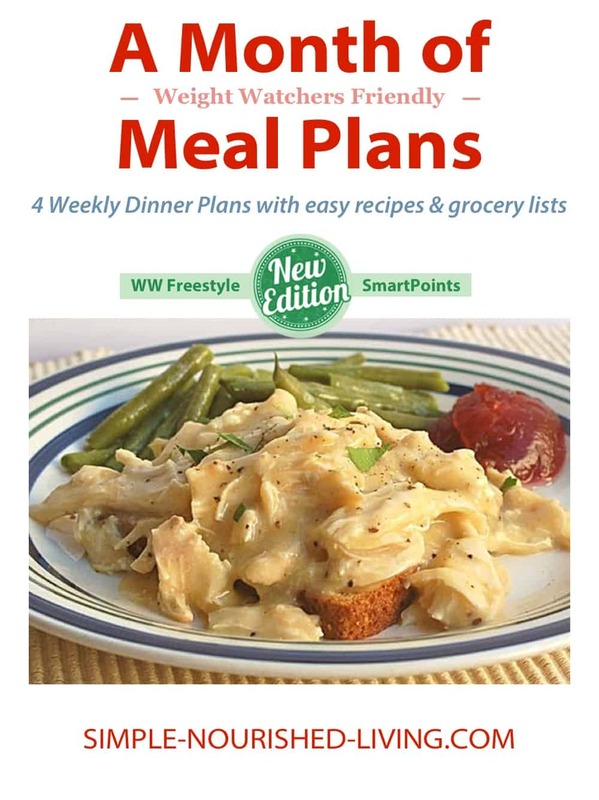 This Month of Meal Plans is designed to make meal planning a breeze. 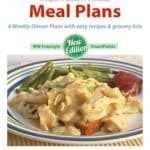 It provides you with a month (four weeks) of meal plans with WW friendly recipes and grocery lists. 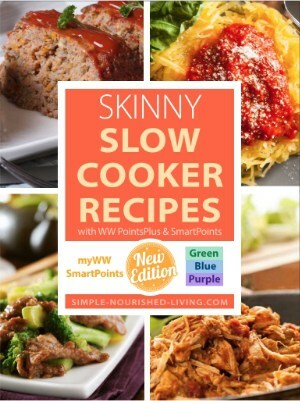 After offering a Bonus Meal Plan with recipes and grocery list as part of my Slow Cook Yourself Slim Bundle, I got tons of requests for more. So I assembled this Meal Plan eBook, the first of what I hope becomes an ongoing series. 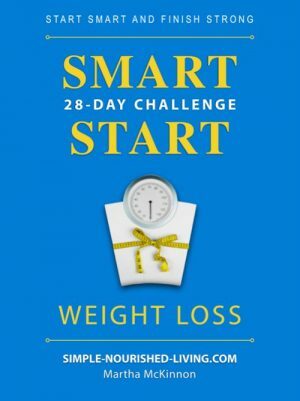 I hope it helps you with your desire to eat great and lose weight, as much as it has me. 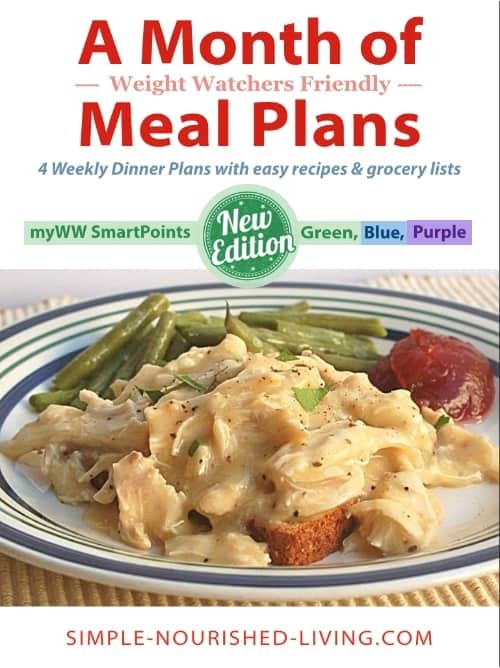 4 weeks of easy healthy Weight Watchers friendly recipes. Each week has 5 recipes and a grocery list for you. 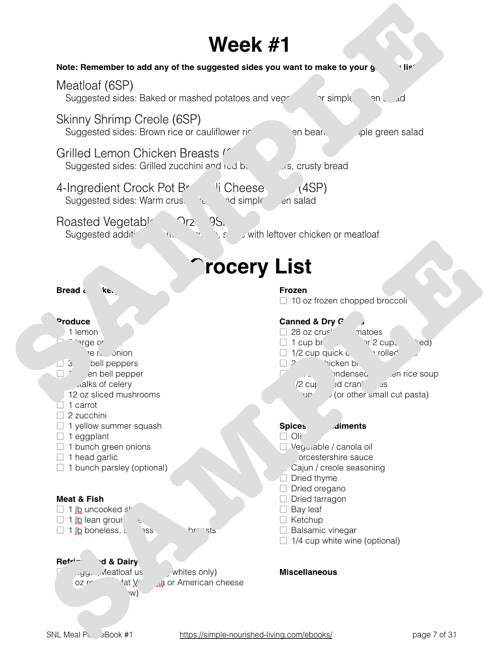 Just print out the meal plan & grocery list to take to the store! When it’s time for dinner, look over your recipe and get cooking! Hi Martha, I absolutely love your ideas and recipes. Everything tastes so good and I have been so much happier now that everyone in my household doesn't have to feel deprived because I'm watching my weight. I did just discover the beauty of the instant pot, so any and all of your ideas are welcome. Thank you! Thank you, very much, Martha, for your quick response & access to the recipes. I enjoy all of your emails of help & encouragement as I struggle to get healthy again by eating better & losing weight! Thank you so much for the "Month of Meals!" I wish I had had this plan while I was still teaching! It's simple, healthy recipes have calmed my life down to the point that I can be much more mindful about my eating habits. My husband and I both are loosing weight and feeling healthier. We are looking forward to trying the 28 day ecourse next. Thank you! Thank you! Thank you! Thank you Martha! Just wanted to let you know that I love your recipes! 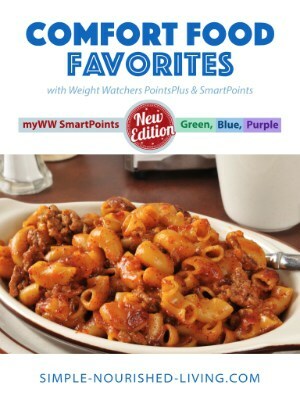 Sweet Martha - I canceled my WW subscription today. I will stay on Freestyle but find I am having great success with your incredible recipes, your inspiring messages and your constant support! 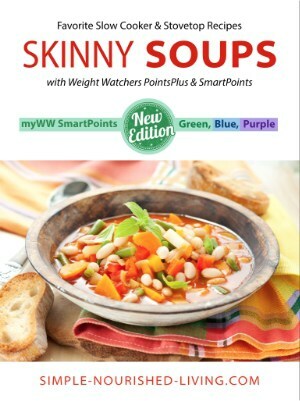 * All nutritional values, SmartPoints® and PointsPlus® for the recipes included in this ebook have been calculated by Simple Nourished Living; Not endorsed by Weight Watchers International, Inc.
More Skinny eCookbooks to Consider!